Recorded as Schaumann, Schaumaker, Schomaker Schumacher, Schuemacher, Schomacher (German), and Shoe, Shoemake, Shoemaker, Schoemaker (English), this is a surname of pre 7th century origins. It derives from the Anglo-Saxon (German) word "schuh" and the Olde English "scoh" meaning shoe and however spelt is job-descriptive for a shoe maker. These early surnames whilst denoting the actual occupation of the namebearer, only became hereditary when a son or grandson followed the original nameholder into the same line of business or skill. Early examples of the surname recording include Hugh Schomaker in the court rolls of Colchester, Essex, England, in 1365, whilst in Germany Andreas Schomacher of Greiswald appears in the charters of that town in 1377. 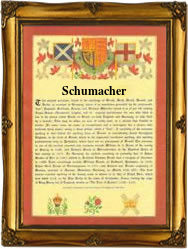 A coat of arms granted to the Schumacher family is recorded heraldically in Rietstap's "Armorial General", and the blazon depicts a shield divided quarterly red and blue, a gold mountain with six peaks in the first and fourth red quarters, and a silver swan, beaked and membered red in the second and third blue quarters. The first recording in England is during the reign of King Edward 111rd (1327 - 1377) and in Germany that of Charles 1Vth of the Holy Roman Empire, 1347 - 1378. Surnames became necessary when governments introduced personal taxation. In England this was sometimes known as Poll Tax. Throughout the centuries, surnames in every country have continued to "develop" often leading to astonishing variants of the original spelling.